Map of France's Chabichou Cheese Region. 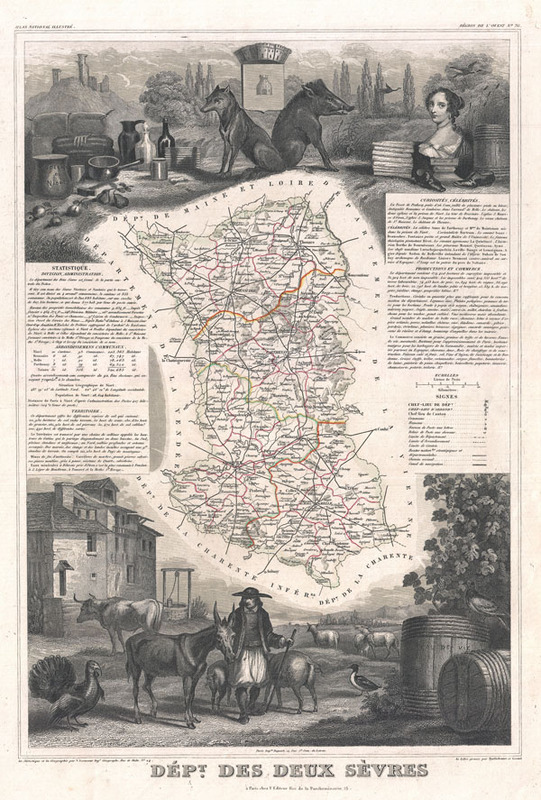 This is a fascinating 1852 map of the French department of Deux Sevres, France. This rural area produces some fines wines, such as Vin du Thouarsais, of Thouarsas. The cheese Chabichou is also made here. Chabichou is a traditional soft, unpasteurized, natural-rind goat cheese (or Chèvre) with a firm and creamy texture. The map proper is surrounded by elaborate decorative engravings designed to illustrate both the natural beauty and trade richness of the land. There is a short textual history of the regions depicted on both the left and right sides of the map. Published by V. Levasseur in the 1852 edition of his Atlas National de la France Illustree.